Did you know that the food and drink industry allocates more of its training budget to compliance than any other discipline? 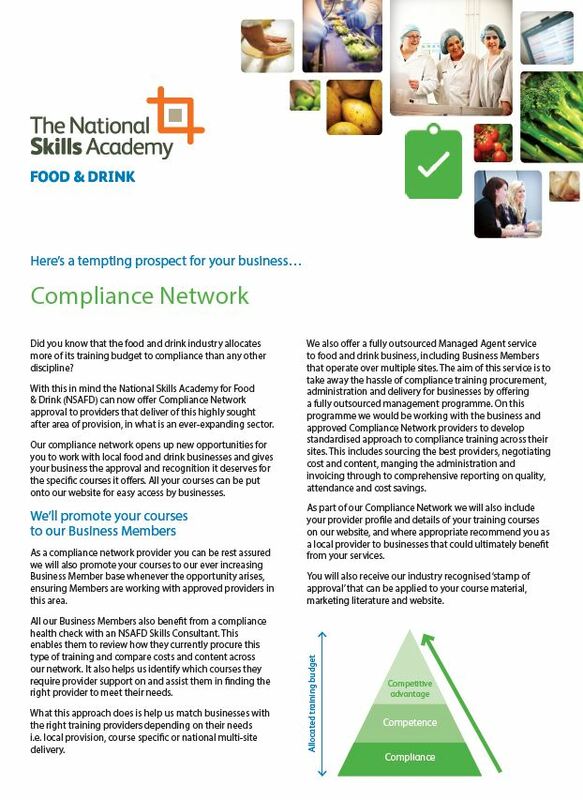 With this in mind the National Skills Academy for Food & Drink (NSAFD) can now offer Compliance Network approval to providers that deliver of this highly sought after area of provision, in what is an ever-expanding sector. Our compliance network opens up new opportunities for you to work with local food and drink businesses and gives your business the approval and recognition it deserves for the specific courses it offers. All your courses can be put onto our website for easy access by businesses. As a compliance network provider you can be rest assured we will also promote your courses to our ever increasing Business Member base whenever the opportunity arises, ensuring Members are working with approved providers in this area. All our Business Members also benefit from a compliance health check with an NSAFD Skills Consultant. This enables them to review how they currently procure this type of training and compare costs and content across our network. It also helps us identify which courses they require provider support on and assist them in finding the right provider to meet their needs. What this approach does is help us match businesses with the right training providers depending on their needs i.e. local provision, course specific or national multi-site delivery. We also offer a fully outsourced Managed Agent service to food and drink business, including Business Members that operate over multiple sites. The aim of this service is to take away the hassle of compliance training procurement, administration and delivery for businesses by offering a fully outsourced management programme. On this programme we would be working with the business and approved Compliance Network providers to develop standardised approach to compliance training across their sites. This includes sourcing the best providers, negotiating cost and content, manging the administration and invoicing through to comprehensive reporting on quality, attendance and cost savings. As part of our Compliance Network we will also include your provider profile and details of your training courses on our website, and where appropriate recommend you as a local provider to businesses that could ultimately benefit from your services. You will also receive our industry recognised ‘stamp of approval’ that can be applied to your course material, marketing literature and website. As a renowned industry-wide skills body, we have access to all major employers in the sector. You’ll be in great company; many of the best compliance providers serving the food and drink industry are already on board. If you’re already an NSAFD Industry Approved training provider, you can take advantage of this service completely free as part of your current annual fee. Once approved, you’ll receive Academy Approval for the courses registered with us. courses and their corresponding prices for 12 months. By doing this you’ll be helping us offer consistently high quality courses to our customers, as well as enjoy a price guarantee on continued membership.